Cambridge, Mass. – February 25, 2013 – “People have often thought there’s no upper bound for wind power—that it’s one of the most scalable power sources,” says Harvard applied physicist David Keith. After all, gusts and breezes don’t seem likely to “run out” on a global scale in the way oil wells might run dry. Yet the latest research in mesoscale atmospheric modeling, published today in the journal Environmental Research Letters, suggests that the generating capacity of large-scale wind farms has been overestimated. 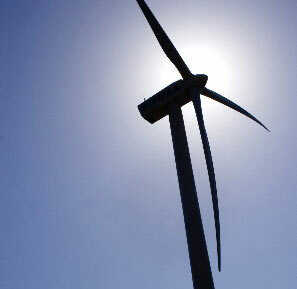 Each wind turbine creates behind it a "wind shadow" in which the air has been slowed down by drag on the turbine's blades. The ideal wind farm strikes a balance, packing as many turbines onto the land as possible, while also spacing them enough to reduce the impact of these wind shadows. But as wind farms grow larger, they start to interact, and the regional-scale wind patterns matter more. An internationally renowned expert on climate science and technology policy, Keith holds appointments as Gordon McKay Professor of Applied Physics at the Harvard School of Engineering and Applied Sciences (SEAS) and as Professor of Public Policy at Harvard Kennedy School. Lead author Amanda S. Adams was formerly a postdoctoral fellow with Keith and is now assistant professor of geography and Earth sciences at the University of North Carolina at Charlotte. “Our findings don't mean that we shouldn’t pursue wind power—wind is much better for the environment than conventional coal—but these geophysical limits may be meaningful if we really want to scale wind power up to supply a third, let’s say, of our primary energy,” Keith adds. A video abstract by David Keith is available for viewing and download here.